Want To Boost Your Blog Income Up To 250%? iWriter Review: Content Mill Goldmine or Scam? VigLink Review: Is This Really Easy Money? 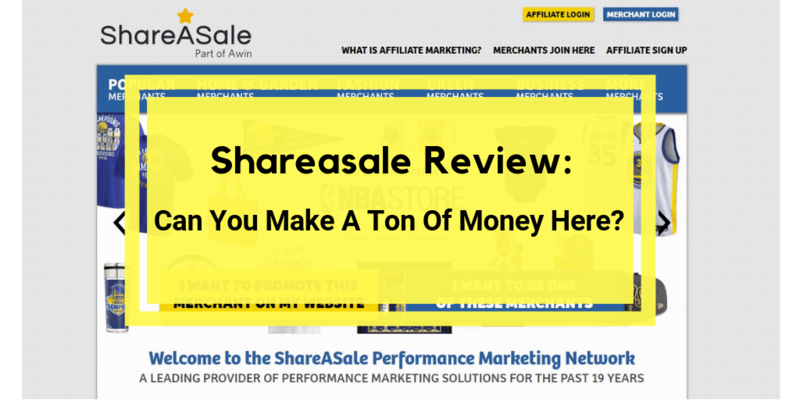 Shareasale Review: Is It A Legit Affiliate Network? No matter what type of website you have, there’s always room to grow your income. By signing up with Shareasale, you would have your pick of tons of name brand merchants willing to help you monetize your site by partnering with them. If you’ve been considering joining Shareasale, perhaps you’ve read a few Shareasale reviews. If you are still on the fence about this company, then read on! Because in this Shareasale review, we’ll uncover the good and the bad. You’ll be stunned by what we found. Stay tuned! Shareasale.com is an affiliate marketing network that brings publishers (aka bloggers or site owners) with advertisers looking for more visibility.. The company was founded in September 2000 by Brian Littleton and is headquartered in Chicago, Illinois. In January 2017, Awin acquired Shareasale to further expand international opportunities for domestic advertisers and publishers. Shareasale is an affiliate marketing network. Affiliates sign up to promote well known products such as Reebok, Wayfair, Claire’s and more. There are many categories to choose from as well, such as accessories, clothing, computers and electronics and more. After you are approved by an advertiser within the Shareasale network, you can promote their products, services, etc. on your website using your personalized affiliate link. You are paid per lead or sale. These are all pretty good features, but if you should get rejected for some reason, there are always other networks to consider such as Maxbounty.com, Traffic Jam Media, iGain.com or Ezoic. How Much Can You Make with Shareasale? Your earning potential with Shareasale will vary depending on the product commission rates and the amount of traffic your site gets. Your earnings will also depend on the type of ads you choose and their placement on your site. Commissions will be based on sales, leads, clicks or other actions as indicated by the merchant. If you would like to preview merchant commission rates, click here. Your income potential will not only depend on the amount of traffic, but also the quality of your traffic, the quality of your content and even engagement on your site. If you think your traffic numbers could hold you back, consider joining Wealthy Affiliate. They will teach you how to get great traffic to your site for free. When Do Shareasale Affiliates Get Paid? Shareasale affiliates are paid on the 20th of each month provided you have reached the payout minimum of $50 or more. International affiliates are paid by direct deposit only. For affiliates within the U.S., payments can be made via ACH or direct deposit. No PayPal or Payoneer. If any of these requirements give you cause for concern, check out other networks such as Maxbounty.com, Traffic Jam Media, iGain.com or Ezoic. Their requirements may be different and make it easier for you to join. Furthermore, they have many of the same features that ShareASale offers. To log into your Shareasale account, click this link. Should you require support, Shareasale can be contacted by phone at 312-321-0487, email at: shareasale@shareasale.com. Their mailing address is: 15 W. Hubbard St., Suite 500, Chicago, IL 60654. We’ve outlined how Shareasale works and some of their features. Now, let’s look at a few things that may make you think twice about signing up with them. Shareasale only pay affiliates through ACH or direct deposit only. No PayPal or other payment methods. If you live outside the U.S., this could be a problem for you. Leaving your account inactive for 6 months or more with a balance of less than $25 can cause your account to be closed. Should your account have a balance over $25, your account will be assessed a $25 fee once a month until the balance is cleared. At which time the account will then be closed. If Shareasale suspect you are not playing by their rules, they can suspend your account and even block you from signing into your account. While this may be rare, it’s still something to keep in mind. According to our research, affiliates who have been locked out of their accounts have a hard time getting restitution. You still need to apply to individual merchants in order to promote their products. This can be a long and cumbersome process. Merchants can reject you for any reason and they don’t have to give you a reason why you were rejected. So even though you may be approved by Shareasale, it doesn’t guarantee that merchants will work with you. These complaints are probably not show stoppers but it never hurts to have multiple streams of income. So you may want to sign up for other networks such as Maxbounty.com, Traffic Jam Media, iGain.com or Ezoic. They will have similar and in some cases, better features. Shareasale is a legitimate affiliate network and can be a great way to monetize your website. No matter what network you decide to join–whether it’s one network or multiple networks–traffic will play a big part in how much money you can make. If you think your traffic numbers are holding you back from making decent money, join Wealthy Affiliate where they will teach you how to get tons of free traffic from Google. Well, I guess that’s all for now. You’ve heard from me, but now I’d love to hear your thoughts about this company. And if you have any questions, feel free to contact ShareASale here or read their blog.